Antonio is an experienced front man who also featured for neighbours Hemel Hempstead before signing for the Saints in February 2018. 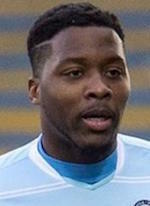 Antonio started his footballing journey by progressing his way through the youth ranks at QPR before reaching 22 league appearances for the Loftus Road side. Short loan spells at Aldershot, Southend, and Yeovil Town followed before securing a permanent move to Stockport County where he enjoyed 16 league outings for the Hatters in the 2011/12 season. German returned south a year later and featured for Brentford, Gillingham and Aldershot Town for a second spell. A change of scenery was next on Antonio’s agenda as he made the bold move to the sub-continent to spearhead the attack for Indian Premier League side Kerala Blasters where he contributed six goals in the seventeen league games over two seasonal spells.